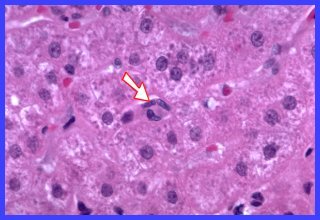 The images shown on this page are from a liver biopsy in which granulomas of undetermined etiology were identified. 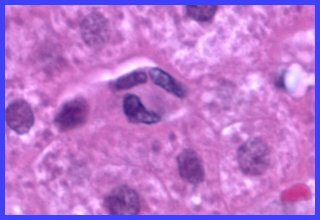 The granuloma in Fig.1 and 1A is tiny and consists of just three macrophages/epithelioid cells; its location suggests origin from Kupfer cells. The granuloma shown in Fig. 2 and 2A is similar in appearance but about double in size. 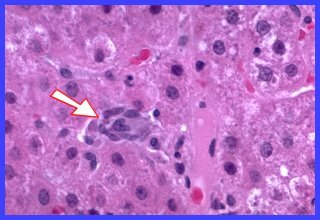 The fact that that there are no lymphocytes admixed with the cells populating these very recently formed granulomas is in marked contrast to granulomas emerging from the alveolitis of sarcoidosis. 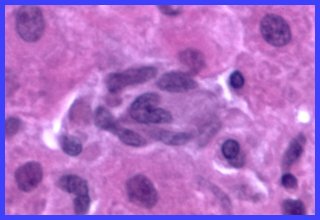 This suggests to me that T-lymphocytes probably did not have a role in the formation of these granulomas.